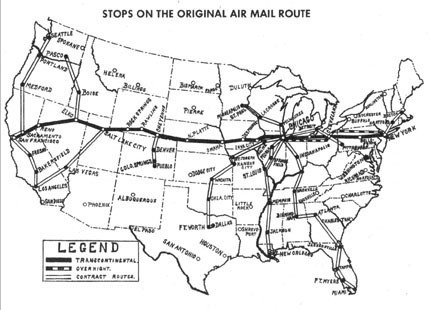 Regular airmail service in the U.S. began on May 15, 1918. It was limited to carriage between Washington, Philadelphia and New York city. The cost was 24¢ per ounce. Transcontinental service began on Sept. 8, 1920 with the inauguration of a 3,000 mile route from N.Y. city to San Francisco. This included intermediate stops in Cleveland, Chicago, Omaha, North Platte, Cheyenne, Salt Lake City, Elko and Reno. The portion westbound from Cheyenne to Laramie was considered to be the most hazardous in the WWI-vintage aircraft because of the stiff headwinds often encountered there. On July 1, 1924 the first night flights of the mail officially began. 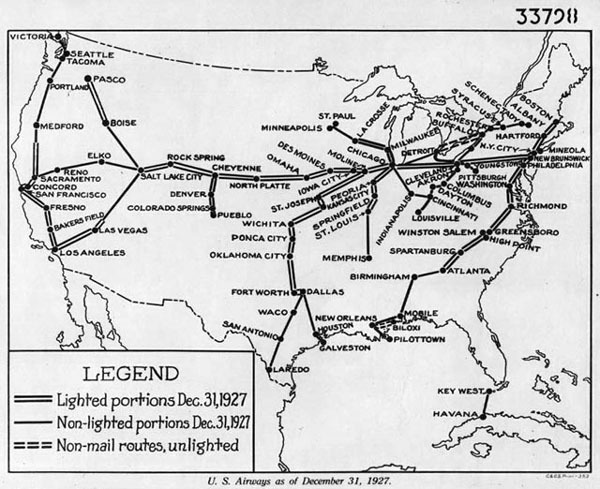 The 3,000 mile transcontinental route had been lighted and marked with a series of beacons. These beacons enabled the pilots to fly at night and in bad weather. The beacons were spaced 15 to 25 miles apart. Each had enough power to be seen for 40 miles in clear weather. At an elevation of more than 8,000 feet above sea level, the Sherman Hill Beacon, in the Rocky Mountains between Cheyenne and Laramie, was not only the highest navigational beacon on the transcontinental route – it was also the tallest in the world. The beacon emitted 5 million candlepower of light and rotated to help guide the pilots. In 1924, the person who maintained the beacon on Sherman Hill was asked to take a photograph of the tower for publicity purposes. Even though once the film was developed it was noted that the top of the tower was missing, this original photograph enjoyed several publicity and advertising uses, including; the cover of “AVIATION” magazine in Dec. 1924, the cover of the “U.S. POSTAL GUIDE” for April, 1925 and in an advertisement for Goodyear Aviation Equipment published in “AERO DIGEST” in Feb. 1926. By 1928, the domestic airmail rate was 10¢ for the first ½ ounce. That year the Post Office Department made plans to significantly lower airmail rates in order to kick-start the relatively new airmail service. The postal service reduced the 10¢ per ½ oz. rate to 5¢ per first ounce – a substantial decrease in those days. The Post Office Department wanted an impressive-looking airmail stamp and the image of the Sherman Hill Beacon fit the bill. Noting the missing top of the tower in the original photo, the P.O.D. 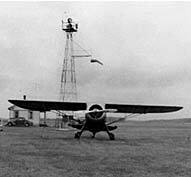 asked Omaha photographer Nat Dewell to photograph a beacon light at Wann, Nebraska and sent pilot Slim Lewis to fly around it in a biplane. 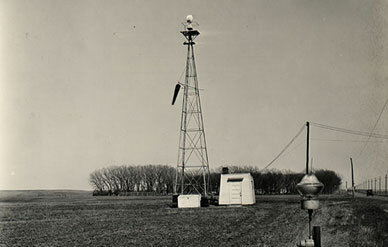 Back at his studio, Dewell combined the two photos for a composite that showed a complete Sherman Hill Beacon with a plane in flight. On July 25, 1928 a brand new 5¢ airmail stamp was issued to service the new rate. 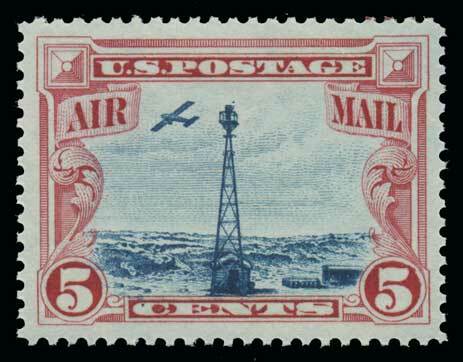 This stamp was the Beacon Airmail stamp – a blue and carmine bi-color stamp featuring the Sherman Hill Beacon. Although the new stamp was released on July 25th in Washington D.C., the new rate did not officially take effect until August 1st . For this stamp to be used before the rate change of Aug. 1st, it was necessary to add additional postage to the cover due to the previous rate of 10¢. Therefore, covers with 2 copies of C11 are known, as are covers with postage-due stamps. This period only lasted for 7 days; therefore, covers from this period are relatively uncommon. Following the Beacon stamp’s issue, there was a dramatic increase in the use of airmail service and many more new routes were inaugurated. By late 1929, airmail service had become so popular that the Bureau could not produce the stamp fast enough. It was proposed to print the stamp in one color only – the blue of all 5¢ stamps of the era. But then, it was pointed out that the non-standard size was also a factor that slowed production. The size meant that there were only 100 stamps per sheet. Earlier airmail stamps, particularly the narrow “map” stamps, were printed in sheets of 200 using only one color. These factors eventually contributed to the demise of the C11 Beacon stamp. The new replacement design chosen was the “Winged Globe” issue #C12 and was printed in one color only – purple. As for the airmail beacons themselves, they eventually became obsolete with the advent of radio and more technologically advanced navigational aids. In the 1950’s and ‘60’s, before the advent of satellites, the Sherman Hill Beacon site was used by the Casper Cable System and KTWO-TV to relay the Denver television signals via microwave. 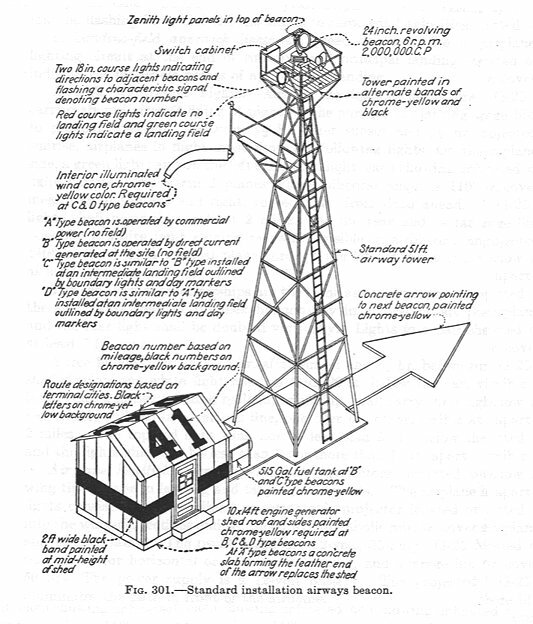 The last lighted beacon from the transcontinental system begun in the 1920’s was dismantled in 1973. Released: July 25, 1928 – Washington D.C.